The governorate of Taizz is both home to Yemen’s third-largest city and a central battleground of its crushing civil war. Here, the human toll exacted by the seemingly endless conflict is wrenching: severe food shortages, heavily damaged infrastructure and public services, growing malnutrition and what the United Nations calls, “irreversible livelihood asset stripping” as rural areas families are forced to sell or slaughter their prime source of wealth–their farm animals–to stay alive. It was into this world of despair that International Medical Corps launched an innovative program two years ago to restore livelihoods to 245 households in an especially hard-hit district of Taizz that had lost so much to the war. The program provided vouchers redeemable at local livestock fairs for up to three goats or sheep. Households with malnourished children were prioritized. For those households selected, it was a chance to both protect and rebuild livelihoods lost to the fighting. Above all it was a chance to begin again. In a country crippled by war and strangled by bureaucracy, the logistics of the program were daunting. They involved identifying and screening eligible recipients, reputable vendors and appropriate healthy animals. Then there was collaboration and coordination with local Ministry of Agriculture officials to screen, certify, quarantine, vaccinate and deworm the animals before delivering them to their new owners. Finally, our team provided salt-lick mineral blocks, an initial supply of feed for the animals and training for household members on how to improve animal nutrition, disease surveillance and control parasites. As it unfolded in the midst of war, there were inevitable delays, but there were also results and valuable lessons learned. A survey conducted one month following distribution, found widespread endorsement of the distribution process. The results also showed over 90% of the recipient households still had all three of their new animals and that three-quarters of beneficiaries expressed satisfaction with the quality of the livestock they received. But nearly a year after the program concluded, perhaps the best measure of success is anecdotal —the healthier appearance and restored sense of hope among beneficiaries. “The difference is clear to see,” said Joseph Bangnikon, International Medical Corps Food Security and Livelihoods advisor. “We’re making a significant impact. “Households with livestock benefit from what the animals produce such as milk and meat,” Bangnikon added. “They also have a chance to sell some of the offspring, giving them cash to buy critically needed food items. In addition, cash finds its way into the local economy through the livestock fairs while livestock keepers earn income to support their families’’. After achieving such encouraging results with its initial effort, International Medical Corps currently administers a larger OFDA-funded follow-on program in Taizz that is expected to reach about 950 households. To qualify for vouchers, households must include small children and nursing mothers struggling with either modern or severe acute malnutrition. The first livestock distribution fair is planned for October 2018. Sadly, locating such households won’t be difficult. Even before the war broke out in March 2015, Yemen was the Middle East’s poorest country, struggling to manage chronic malnutrition. Today, as the war grinds on, nearly two-thirds of the population is food insecure and only half the country’s health care facilities still operate. Hunger, malnutrition and the threat of famine are ever-present dangers in a country where nearly two-thirds of the population has no idea when or from where their next meal will come from. More than 1.1 million pregnant or nursing mothers and nearly 2 million children are malnourished. 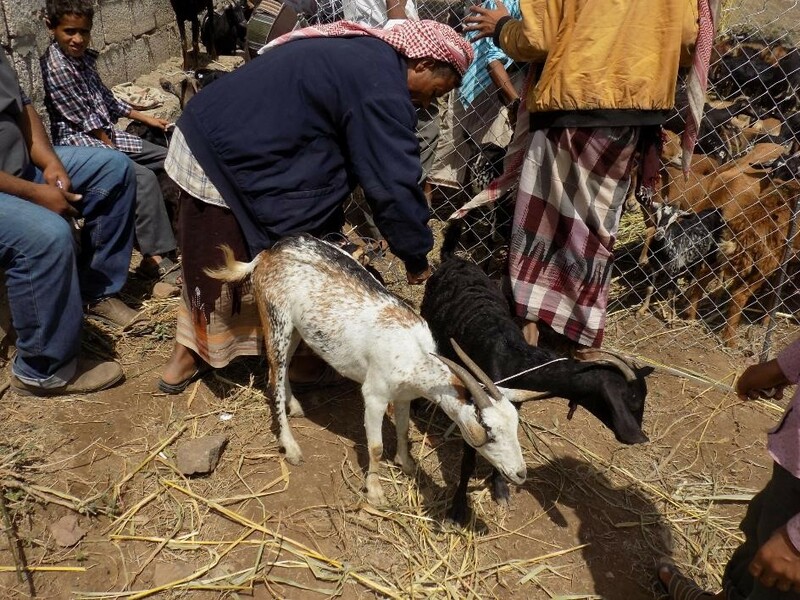 The choice of animals to distribute —small farm livestock known as ruminants, in this case either sheep or goats— is key to improving livelihoods among Yemen’s poor. Ruminants, an animal group that also includes cattle, deer and camels, have a digestive system that allows them to live on relatively cheap grasses and other plant-based foods. In Yemen, it is primarily women and children who tend such livestock, which can survive on pastureland, often close to the family homestead. As a result, it is the women who are likely to take control of the new goats and sheep. The new responsibility enhances their status and better positions them to control the distribution of animal by-products such as milk and cheese to household members who most need their nutritional value or sell the products to increase household income. Drawing on lessons learned from the initial program, animal recipients will receive an initial supply of locally purchased animal feed and mineral salt links at the same time they get the animals, enabling the new owners to get through their first few days more easily with their new animals. To better assure sustainability of the program, we have proposed that licensed Ministry of Agriculture veterinarians train 50 new Community-based Animal Health Volunteers (CAHVs), who can help restore basic primary veterinary care and strengthen elements of a national livestock surveillance system that has ceased to function since the war began. Staffed before the war by Ministry-supported veterinary assistants who monitored and treated minor animal disease outbreaks, the system fed into a national data base that provided an overall picture of the country’s livestock, its health and any potential risks to that health. Under our proposal, the new CAHVs would be selected from—and with the participation of–communities participating in the program. Their training would enable them to monitor animal health issues, report disease outbreaks, assist in animal selection and train members of recipient households how to handle and process milk, and participate in emergency vaccination and treatment campaigns. In addition to livestock replacement, an assessment supported by the German development cooperation group, Misereor (https://www.misereor.org/), is now underway to identify new livelihoods opportunities to diversify economic opportunities beyond animals to include staple food crops which beneficiaries can either sell or eat themselves.